Flagstones are a popular choice for backyard patios because they have an earthy and natural look. The patio blends in with the surrounding landscape. 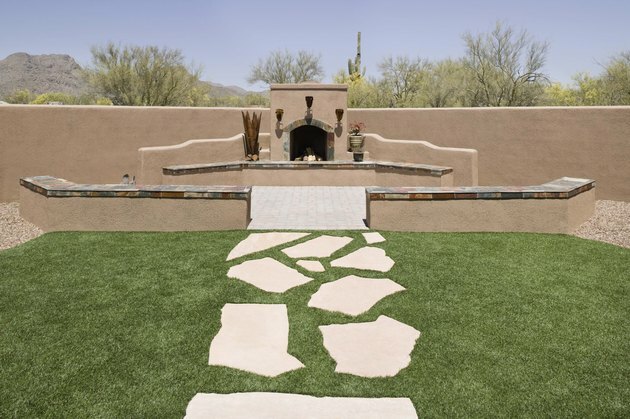 If you like that natural look of flagstone, you can take it a step further by adding grass between the flagstones. The process is quite simple, but first you need to get the flagstones set in sand. Once you decide on where you want your new patio, you'll need to start with excavating the area. Map out the dimensions of the patio and set a wooden stake at each corner. Tie the corners with twine until you have a bordered-off area for your new patio. Now you can break ground. It's important to know how deep you need to dig. For sand-set flagstone patios, you will need to lay down four inches of gravel, two inches of sand and some thin layers of landscape fabric. With this in mind, your hole for the patio will be approximately six inches. Once you've dug up the area, lay down the gravel. It's recommended to use a power tamper to tightly pack the gravel. Your next step will be laying landscape fabric over the entire area of gravel. The fabric will stop weeds and any other unwanted foliage from popping up around the flagstones. Then you will add the four inches of sand. Lightly water down the sanded area and smooth it out with a piece of wood or another garden tool. Once the sand is tightly packed, you can begin laying out your flagstones. Laying out the actual flagstones is much like putting a puzzle together. Before you set them, do a dry run next to the sand bed. This will allow you to have an idea of how you want the patio to look ahead of time. Then just duplicate that look on the sand bed. You will need to use a rubber mallet to lightly pound the flagstones into the sand. Then you'll use a straightedge to make sure all of the neighboring stones are level. With all of the stones in place, fill in the joints between the stones with sand, grass seed and soil. In order to grow grass between the joints, put together a mixture of potting soil, seeds and sand. Then fill the joints around the stones with the mixture. You should have a depth of about one inch or less between the joints. After you've spread all of the soil mixture with a garden trowel, spray water over the entire patio and let it dry. If there are still low points in between the joints, add more soil, seed and sand mixture and water it again. Sweep any loose soil off the stones and into the joints. Keep the grass seed moist while it is sprouting and starting to grow. Ask your local garden store about the types of grass seed that work best between flagstones. You can also choose moss or flowers for the patio. Some popular moss choices for flagstone are Irish or Scotch moss, while some small flower types includes alyssum, forget-me-not and sedum.